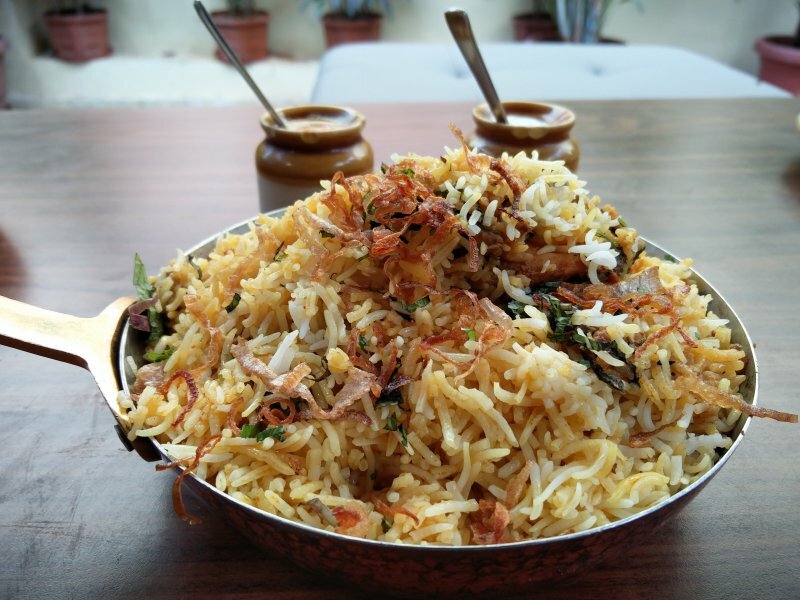 Hyderabad is famous all over the world for it’s delicious Biryani. But the fact is that most of the Biryani sold in the famous cafes and hotels have become a commercial variant of the original. We have Nawab Mehboob Ali Khan,a connoisseur of Hyderabadi cuisine take us through a step-by-step recipe of the original Kacchi Gosht ki Biryani. Lamb Meat – Only Male Lamb aged between 6-8 months. Note : The meat should be washed only once and not left in water. For the experts who carve their meat, in fact it should be dressed in such a way that it doesn’t require washing at all and or cleaned with dry cloth. The meat has to be continuously mixed as each ingredient is being added. The Rice has to be semi-cooked in hot water with some oil and Potli Masala. The first layer of rice for the Biryani which is layered in the handi is about 50% cooked. Next comes the marinated meat. It’s ideal to let the marinated meat for rest before using so that it can soak in all the flavors. Another layer of rice is then put on top of the meat which is about 75% cooked. Hyderabadi Biryani is always cooked on firewood and only in copper vessels. In case of absence of a copper lid, aluminum foil can be used too. The handi is then tightly sealed so as to let the Biryani cook on dum. Good meat is always the first to cook than the rice for the Biryani. It takes about 45mins-1hour for the entire cooking. Note: Limit the usage of Papaya paste in the marination because it gives the meat a very powdery taste. Below is the recipe video to take you through the process.